At times you may want to add an existing task to a the agenda of a new meeting. This can be a task you created in another meeting or a stand-alone task you created in the app or via email. Example: you are VP of marketing and in the management team meeting you created a task that needs to be done by one of your marketing people. In your one-on-one meeting with that person or in your marketing team meeting you simply drag the existing task onto the agenda. 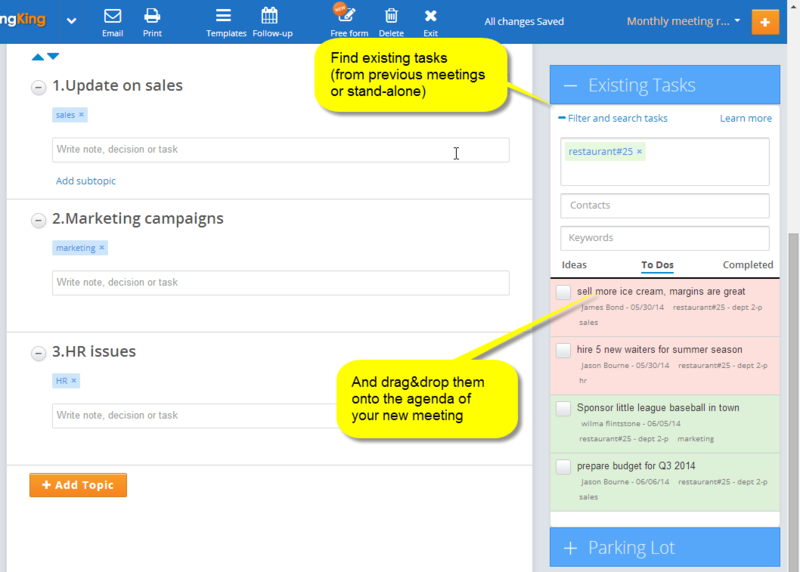 Just as on the tasks page you can filter you tasks to easily find what you are looking for. You can filter by person (task owner), project, department and tag. Similar like the task page tasks are organized by “Ideas”, “To Dos” and “Completed”.